Dale Tallon wasn't at the Wachovia Center on Wednesday night, but his impact was still felt as Patrick Kane scored the Stanley Cup-clinching goal in overtime and Jonathan Toews lifted the most revered trophy in all of sports, bringing an end to nearly half a century of frustration for the Chicago Blackhawks. Tallon, responsible for drafting that dynamic young duo and helping build the Blackhawks into a championship contender, was hired last month as the general manager of the Florida Panthers. Although he's left the organization he served for more than three decades as a player, broadcaster and member of the front office, he still had strong feelings watching the events unfold on television. "It was the greatest time of my life. I owe everything I have to that organization and the Wirtz family," Tallon said as a guest on Thursday night's "NHL Hour With Commissioner Gary Bettman." "The ups and downs and everything that has gone on there the last 33 of the 49 years it took to win the Stanley Cup, to see that come to fruition last night was pretty emotional. Obviously bittersweet, I was very happy for them and very proud of what's gone on there, what contributions we were able to make." Watching the game with Panthers Alternate Governor Bill Torrey, it took a few seconds for Tallon, like seemingly everyone other than Kane, to realize the puck had entered the net and the Cup had been won. "We kind of looked at each other and we thought something had gone in. 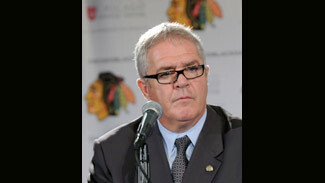 We weren't quite sure," Tallon said. "It was just a tremendous feeling of satisfaction, vindication, all of these things. It was an emotional roller-coaster ride last night and thank god Bill was there to keep me grounded. Tears of joy, for sure." With the 2009-10 season now officially over, it's time to start looking ahead, starting with the upcoming Entry Draft in Los Angeles. Bettman asked Tallon what he has been doing to prepare and if it's at all difficult starting on the job only a month beforehand. "I've kept busy watching and seeing at least the top 30 (prospects)," he said. "I'm familiar with the top 30, and then you have to trust the scouting staff they have in place and rely on friends and people who are around that have seen players and obviously use all the testing and tools available to make sure that we don't screw up." Holding the No. 3 pick as well as three second-round selections, the Panthers will have an immediate opportunity to build their team the way the Blackhawks did under Tallon. A decade has now passed since Florida last qualified for the Stanley Cup Playoffs, but the new GM relishes a challenge and sees plenty to work with already there. "The ups and downs and everything that has gone on there the last 33 of the 49 years it took to win the Stanley Cup, to see that come to fruition last night was pretty emotional. Obviously bittersweet, I was very happy for them and very proud of what’s gone on there, what contributions we were able to make." "We have some really talented young players in (Dmitri) Kulikov and David Booth, (Stephen) Weiss and (Nathan) Horton and (Michael) Frolik," he said. "We have some good pieces to the puzzle and some good veterans in (Bryan) McCabe and (Keith) Ballard and the young defenseman (Jason) Garrison. And then goaltending is very strong with (Tomas) Vokoun winning the World Championships and the gold medal, he was brilliant. "So we're good in goal and we're mobile on the back end. We need to get bigger, stronger, more physical up front. That's what we're going to be looking to add in this year's draft." One person familiar with Tallon's work who expects him to succeed is longtime Blackhawks broadcaster Pat Foley, who also joined Bettman as a guest. "Like anything else I think it's going to take time. They probably need to change a bunch of the culture," Foley said. "But if the ownership and the fans have a little bit of patience, you look at the team that's going to be donning rings here in a few weeks, and these are (Tallon's) players. I mean, he drafted every one of them and he traded for every one of them. "I knew this when I worked with him as a broadcaster: He has a wonderful ability to assess talent. He notices little things that can become big things with how players approach the game. I think he has a real gift as a scout. He had a large hand in putting together the Blackhawks, the 2010 champs, and I think in five or six years with the Florida Panthers, there may be some partying going on down there. Foley was on hand at the Wachovia Center on Wednesday to witness the Hawks become champions, completing a remarkable turnaround for a franchise that was residing near the bottom of the Western Conference standings just a few seasons ago. "It's been a complete 180, as you're well aware, from where it had been," Foley said. "I will say that four years ago, and prior to that, I never would have guessed this day would happen in my lifetime. What Rocky Wirtz has done -- I mean, the first thing he did was say, ‘Our goal is to win the Stanley Cup.' Those words had never been spoken in Chicago, and I grew up here. He set the bar high, he went about getting together as good a management team as there is in pro sports, I would say." In what served as the final edition of NHL Hour this season, Bettman also noted that ice hockey participation was up 60 percent this past season, to 3.1 million in the United States. That was by far the largest jump of any sport, with cross-country skiing coming in second at a 6.4 percent increase.